Performance – Perfection Redefined. Tired of blowing the throttle body / Y-pipe hose off on your high powered Porsche 997.1 Turbo? For engines fitted with the IPD 82mm throttle body conversion plenum, this may be something that has plagued your vehicle more times than once. When a reoccurring problem exists with an aftermarket upgraded engine component, our engineering team jumps into action and figures out a way to solve these problems. This is evident with our new, 100% leak proof throttle body clamp system designed specifically for the 82mm large throttle body / IPD plenum conversion. 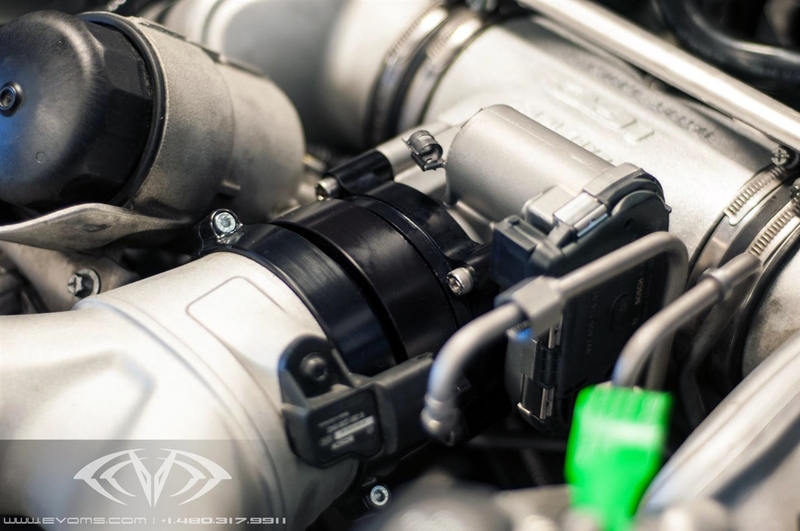 The IPD plenum with the larger 82mm throttle body is an excellent upgrade for any Porsche 997.1 Turbo. It provides the engine with better airflow characteristics for improved throttle response and overall engine power. 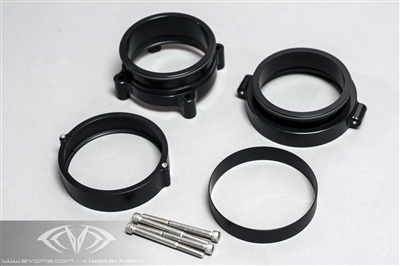 With this increased power, comes a trade off with a potential weak link with the provided silicone hose / traditional hose clamp connection that is made between the OEM Y-Pipe and larger 82mm throttle body. Read on to see how our engineering team solved this problem with a 100% fail proof system. Unsurpassed Quality, Fitment and Performance…Made in Arizona: With engines pushing 600+ HP and producing higher than stock boost pressures, the silicone hose / hose clamps included in this IPD conversion kit cannot hold the pressure and the throttle body hose simply blows off. This is due to the engine moving away from the Y-Pipe and the hose clamps not being able to hold the hose in place. On our EVT engine conversions where we incorporate the IPD plenum with the 82mm larger throttle body, we had this reoccurring problem and needed to engineer a solution to provide a 100% leak proof way to contain the higher boost pressure without any risk of failures. EVOMS’ tried and true 100% fail proof system is now available as an accessory kit for anyone with the 82mm throttle body / IPD plenum conversion who wants the peace of mind of never having a stranded vehicle due to this common problem. Engineering, Design, Proven Performance WITHOUT Compromise: Sometimes the easy approach is not the answer to a somewhat simple problem. We have tried all sorts of “fixes” to try and remedy the hose failure with different and much simpler approaches. The one we have here was the only solution that proved affective 100% of the time. This is not a “band aid” approach, but one that we incorporate on our 1000+ HP engine conversions pushing north of 35 PSI of boost in race applications. If it can hold that kind of pressure, it will certainly retain the boost of a 600+ HP street car.